The Centre for Environmental Law hosted its inaugural lecture "Access to Environmental Justice: The Effectiveness of Law" presented by the Hon Justice Brian J Preston SC, Chief Judge, Land and Environment Court of New South Wales. Environmental justice includes at least three concepts: distributive justice, procedural justice and justice as recognition. This presentation highlighted aspects in which the law is helping or hindering access to environmental justice in these senses, with a particular focus on New South Wales. Chief Justice Preston ended the event advising that achieving access to environmental justice requires a holistic and comprehensive approach, tackling the factors outlined which impede equal justice for all, leaving the audience to reflect on how this might be done. Over the last decade there has been an evolving debate both within the United Nations and within the scholarly literature, as to whether it would be feasible and-or advantageous for the United Nations Security Council to consider climate change as within its purview. Given that irreversible global warming is underway and that this will inevitably have multiple global security implications - and indeed, that the Council has to some degree already addressed the issue - such a debate has become anachronistic. This presentation will review some of the factors that need to be taken into account in moving beyond a binary discussion of whether or not the Security Council should consider climate change. It maps four broad categories of action, situates the Council response to date within those categories, the likelihood of each being perceived as legitimate, and the prospects for an increased Council role in future. Shirley Scott is an Associate Professor of International Relations at UNSW. She works at the intersection of International Law and International Relations and has published widely in both disciplines including on aspects of climate change governance. She jointly edited with Professor Rosemary Rayfuse, International Law in the Era of Climate Change (Edward Elgar 2012) which was cited in the recent IPCC report as establishing the need to strengthen institutional synergies. Her current project examines the scope for action by the UN Security Council. Associate Professor Scott is Research Chair of the Australian Institute of International Affairs and a member of the executive council of the Asian Society of International Law. The effects of climate change present an increasing threat to the lives of individuals and local communities, making us all more vulnerable to extreme weather. In light of this increased instability and insecurity Macquarie Law School’s Centre for Environmental Law, in partnership with Ku-ring-gai Council, hosted a critical sustainability dialogue, bringing together leaders in science, law, business, government and communities to discuss climate security at the local level. This event marks the commencement of a Memorandum of Understanding signed between Macquarie University and Ku-ring-gai Council in late 2014, under which the two organisation’s have agreed to work in close partnership for the benefit of local communities and environments. The unusually stable Earth system of the Holocene epoch of the past 10,000 years, in which human civilization arose, is yielding to a more dynamic and unstable Anthropocene driven by human practices. The consequences for key institutions such as states, markets, and global governance, are profound. Path dependency in institutions complicit in destabilizing the Earth system constrains response to this emerging epoch. Institutional analysis can highlight reflexivity as the antidote to problematic path dependency. A more ecological discourse stresses resilience, foresight and state shifts in the Earth system. Ecosystemic reflexivity can be located as the first virtue of political institutions in the Anthropocene. Undermining all normative institutional models, this analysis enables re-thinking of political institutions in dynamic social-ecological terms. John Dryzek is Australian Research Council Laureate Fellow and Centenary Professor in the Centre for Deliberative Democracy and Global Governance at the Institute for Governance and Policy Analysis, University of Canberra. He was previously Distinguished Professor of Political Science and Australian Research Council Federation Fellow at the Australian National University. He is a Fellow of the Academy of Social Sciences in Australia, former Head of the Departments of Political Science at the Universities of Oregon and Melbourne and of the Social and Political Theory program at ANU, and former editor of the Australian Journal of Political Science. Working in both political theory and empirical social science, he is best known for his contributions in the areas of democratic theory and practice and environmental politics. His most recent book is Democratizing Global Climate Governance (Cambridge University Press, 2014, with Hayley Stevenson). He is currently co-editing The Oxford Handbook of Deliberative Democracy. The Centre would like to welcome Associate Professor Carlos Bernal-Pulido, as one of our newest members. His interests include constitutional law, comparative environmental law, jurisprudence and torts. In the area of environmental law he is currently undertaken a research project on the protection and adjudication of the constitutional right to water in the global south, and on the protection of the right to healthy environment in Latin America. We look forward to his contribution in these areas of research and the Centre's undertakings. The Centre would like to welcome aboard two new associate members, Andrew Burke and Zara Bending. Both are PhD candidates and staff at Macquarie Law School, exploring areas of environmental law in their research. The Centre for Environmental Law recently held its inaugural lecture: “Access to Environmental Justice: The Effectiveness of Law”, presented by the Hon Justice Brian J Preston SC Chief Judge, Land and Environment Court of New South Wales. The night was a success, with participation ranging from academics, students and interested members of the public. The lecture focused on three crucial concepts of Environmental justice: distributive justice, procedural justice and justice as recognition. The presentation highlighted aspects in which the law is helping or hindering access to environmental justice in these senses, with a particular focus on New South Wales. The Centre recently held the first annual Student Paper and Presentation Competition. This year, the focus of the paper and presentations was about Global Climate Change week in light of this year's UNCCC held in Paris. The subject of the submissions was based around the efficacy of current global problem solving strategies in relation to climate change and its effects. There was a pleasing contribution from first year law students as well as interesting presentations from diverse perspectives. The winners of the Presentation Competition were Samantha Marshall and Anneliese Cooper. The winner of the Paper Competition was Jennifer Tridgell. We would like to congratulate these outstanding contributions, as well as the effort and standard of all the entries. We would also like to thank again, the time and effort from the esteemed judging panel including, Mrs Judith Preston, Mr Paul Govind and Mr George Tomossy. We look forward to seeing more high quality entries next year! Congratulations to our newest member, Zara Bending, for being appointed to the Board of Directors for the Jane Goodall Institute Australia. Regional/subregional assessments on biodiversity and ecosystem services, for Asia and Pacific region. Kirsten was nominated for this role by the Australian Government. Kirsten has been invited as one of twenty global experts scoping the global assessment on biodiversity and ecosystem service, which corresponds to Deliverable 2c of the IPBES work programme. This assessment will investigate the status and trends of biodiversity and ecosystem services, the impact of their changes on human well-being and the effectiveness of responses to changes, including the Strategic Plan for Biodiversity 2011-2020 of the Convention on Biological Diversity and its Aichi Biodiversity Targets. Kirsten was nominated for this role by the International Council for Science (ICSU) and Future Earth . Congratulations to our Advisory Board Member, Professor Ben Boer on recently receiving the Senior Scholarship Award by the International Union for Conservation of Nature (IUCN) Academy of Environmental Law. This international award recognises excellence and creativity in scholarship produced by scholars during the five years preceding the Award. We heartily congratulate Ben for this well-deserved recognition of the contributions he continues to make to environmental law! Kirsty, an Associate member of the Centre, is a member of the Global Network for the Study of Human Rights and the Environment (GNHRE). The GNHRE members have developed the Draft Declaration on Human Rights and Climate Change that has been released recently in preparation for the 2015 United Nations Climate Change Conference (COP 21). Kirsty was one of thirteen authors from across the world who have drafted this declaration and the only Australian. Sustainability Dialogues 2014: Achieving Climate Change Adaptation is part of a series of annual symposiums held by the Centre for Environmental Law (CEL), Macquarie University which aims to facilitate discussion on international and domestic environmental law issues and provide a forum for future direction in sustainable development policy. The Sustainability Dialogues 2014 will investigate various aspects of climate change adaptation including, inter alia, best practices, challenges being faced across the developing world, strategies to facilitate capacity building and the development of new strategic stakeholder partnerships to facilitate adaptation. Speakers and forum include leading academics, judges, policy makers, lawyers and community organizations. The event will take place in the form of a forum with a 90 minute panel discussion in which participants can pose questions to panel members. Sustainability Dialogues 2014 is open to decision and policy makers, lawyers, scientists, non-government organisations, businesses, students as well as interested members of the public. Ben Richardson, Fiduciary Law and Responsible Investing: In Nature's Trust (Routledge: London, 2013); xi; 334 pp. (sole author). Hart, B.T. and Taylor, M.P. (Eds.) (2013). Review of the surface water management and monitoring associated with the Ranger Uranium Mine, Northern Territory, Australia, Volume 1 - Main Report, Report of the Independent Surface Water Working Group, Energy Resources of Australia Ltd, Darwin, January 2013, 40pp. Hart, B.T. and Taylor, M.P. (Eds.) (2013b). Review of the surface water management and monitoring associated with the Ranger Uranium Mine, Northern Territory, Australia, Volume 2 - Consultant Reports, Report of the Independent Surface Water Working Group, Energy Resources of Australia Ltd, Darwin, January 2013, 352pp. Taylor, M.P. 2013. Independent Surface Water Working Group (ISWWG): A Review of the ISWWG Project Reports. In Hart, B.T. and Taylor, M.P. (Eds.) (2013b). Review of the surface water management and monitoring associated with the Ranger Uranium Mine, Northern Territory, Australia, Volume 2 - Consultant Reports, Report of the Independent Surface Water Working Group, Energy Resources of Australia Ltd, Darwin, January 2013, pp. 27-34. 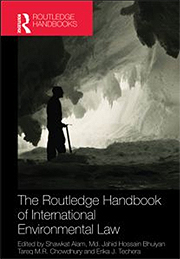 The Routledge Handbook of International and Environmental Law, co-authored by MU-CIEL Director Shawkat Alam, will be published in September 2012. This advanced level reference guide provides a contemporary and comprehensive overview of international environmental law. The book draws on sources from international experts from developing and developed countries to provide a truly global approach. Contemporary and Future Challenges - analyses pressing current and emerging issues in the field. Ben Richardson, Local Climate Change Law: Environmental Regulation in Cities and Other Localities (Edward Elgar Publishing: Cheltenham, 2012); xviii; 401 pp. (sole editor and chapter author). Davies PJ, Ives CD, Taylor MP & Findlay SJ (2012) Does science contribute adequately to the decision-making frameworks used to protect urban rivers and riparian systems? In Grove, J.R. and Rutherford, I.D (eds.) Proceedings of the 6th Australian Stream management Conference, Managing for Extremes, 6-8 February 2012, Canberra. pp. 549-557. Findlay SJ, Jonasson OJ, Davies PJ, Taylor MP & Gore DG (2012) Extracting base flow to substitute for potable water use - how much is too much for urban stream health? in Grove, J.R. and Rutherford, I.D (eds.) Proceedings of the 6th Australian Stream management Conference, Managing for Extremes , 6-8 February 2012, Canberra. pp. 68-75. Greene, GR, Begg G & Davies, PJ (2012) Climate change impact assessment - the Sydney Catchment Authority's approach. Proceedings of the Australian Water Association OZwater 2012 Conference 8-10 May 2012, Sydney. Professor Natalie Klein to present "From Eco-Terrorism to Eco-Tourism: Assessing Effective Regulatory Tools and Regimes in Marine Management" at the ILA Regional Conference in Taipei, May 2011. Towards RIO+20: Contemporary Issues in International Environmental Law at ANU, Canberra, on 28 May 2011. Emeritus Professor Zada Lipman presents "Climate Change and Coastal Protection", at the Land and Environment Court of New South Wales Annual Conference, 5 - 6 May 2011, Sydney. Professor Natalie Klein and Dr Erika Techera present at the American Society of International Law meeting in Washington DC on 27th March 2011. Centre member Dr Natalie Klein appointed Dean of the Macquarie Law School from 2011. Dr Erika Techera publishes "Safeguarding cultural heritage: Law and policy in Fiji" in the Journal of Cultural Heritage. Emeritus Professor Zada Lipman and Dr Robert Stokes publish new article - Z Lipman & R Stokes, "That Sinking Feeling: A Legal Assessment of the Coastal Planning System in New South Wales (2011) 28 Environmental Planning & Law Journal 1 - 19. Emeritus Professor Zada Lipman publishes "An Evaluation of Compliance and Enforcement Mechanisms in theEnvironment Protection and Biodiversity Conservation Act 1999 (Cth) and their Application by the Commonwealth". (2010) 27 Environmental and Planning Law JournaI 98-112. Associate Professor Natalie Klein and Dr Erika Techera publish journal article "Fragmented Governance: Reconciling legal strategies for shark conservation and management" (2011) 35(1) Marine Policy 73-78. Robert Stokes, MP for Pittwater, will speak at Macquarie Law School in LAW490/861Local Government and Planning Law. The presentation will be on 28th February 2011 from 9-11am in W6B 320. Dr Shawkat Alam presents The Linkages between Climate Change, Poverty and Sustainable Development: An Appraisal of Inter and Intra-Generational Equity at the IUCN Academy of Environmental Law 8th Colloquium at Ghent University. Associate Professor Natalie Klein presents at ANZSIL - July 2010. Dr Erika Techera co-chairs the 9th Global Conference on Environmental Justice and Global Citizenship - July 2010. Associate Professor Natalie Klein and Dr Erika Techera present at the Sharks International Conference - June 2010. Associate Professor Natalie Klein presents at the Pirates of the Southern Ocean Conference ANU, Canberra - April 2010. Emeritus Professor Zada Lipman joins MU-CIEL -September 2010. Centre relaunches as the Centre for International & Environmental Law. Dr Erika Techera and Associate Professor Natalie Klein have been successfully awarded a Macquarie Research Development Grant to explore legal strategies for the sustainable management of shark ecotourism activities. Listen to Associate Professor Natalie Klein's interview on ABC Radio Australia - Australian protest over Japanese whaling may be end up being futile - 16 April 2010. The Centre's research has been highlighted in Macquarie's QUEST Research Magazine - Protecting Cultural Heritage - Issue 1, 2010. Read Associate Professor Natalie Klein's comments in The Australian - Whaling protesters are behaving like pirates - February 2010. Associate Professor Natalie Klein comments in The Australian - Whales Warriors Need Legal Eagles - January 2010. Professor Rafiq Islam "Looming Global Warming Induced Sea Rise and Transfer of Green Technology to LDCs: Challenges and Options for Submersible Bangladesh" (2010) 12 European Intellectual Property Review. Professor Rafiq Islam "The Proposed Australia China FTA: Protectionism over Complementarity?" (2010) 37:3 Legal Issues of Economic Integration 203-219. Associate Professor Natalie Klein and Dr Shawkat Alam's new publication Globalisation and the Quest for Social and Environmental Justice. Dr Erika Techera's chapter entitled 'Customary Law and Community Based Conservation of Marine Areas in Fiji' in the newly released volume Managing Environmental Justice edited by Denis Pavlich. Macquarie Law School interns Joanna Zhou and Melissa Lee at West Coast Environmental Law, Vancouver.